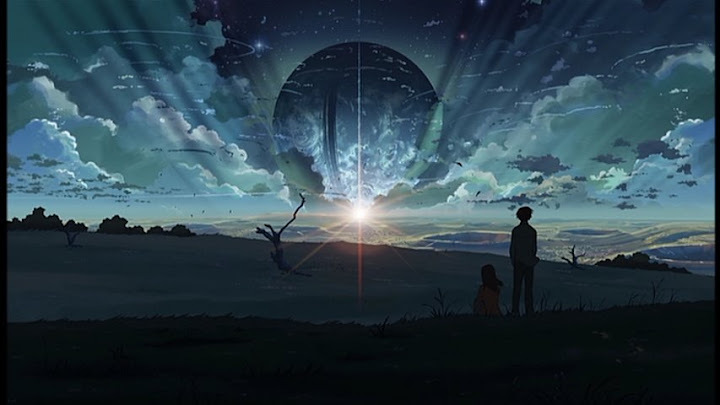 If there was ever such a thing as animated poetry, Makoto Shinkai would be a master poet. 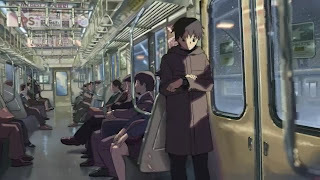 Emotions of all kind swell with the rising tides, whipping winds, and falling snow in his beautiful, poignant 2007 film 5 Centimeters Per Second. 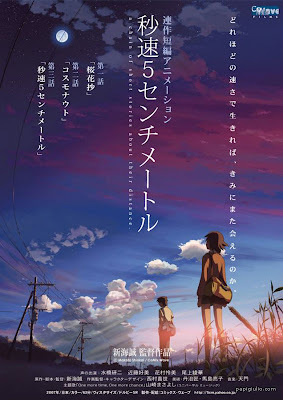 The movie, which is subtitled "a chain of short stories about their distance," follows the simple story of a boy named Takaki Tono and a girl named Akari Shinohara. They meet when they're young and remain friends through elementary school, but are forced to go their separate ways when Akari moves to a new town. The two stay in contact through letters, but as the story progresses, they drift further and further apart. This sad story is told in a three-act structure: part one follows Tono as a middle schooler, part two as a high schooler, and part three as a working adult. While some would classify this as a romance, in truth 5cm (as I will call it from here on out) is a sort of character study of Takaki Tono. It follows him throughout his life as his separation from Akari changes him more and more. While Shinkai's strength doesn't seem to be in characters as much as plot, he makes up for it by choosing a small number of characters to focus on. Side characters like family members and friends are rarely brought up, so the focus remains on Tono, Akari, and Kanae Sumida (a girl who Takaki meets while in high school). 5cm is emotional and heart-wrenching in part because it deals with simple, universal issues. A boy and girl meet, fall in love, and are forced to leave each other. These are things that cross cultural contexts, and understanding this, Shinkai weaves a story that is neither melodramatic nor unrealistic. Bad things happen beside good things, and a single overarching plan for the film is never clear. It's truly like watching someone's life unfold; we feel Tono's pain alongside his momentary joys. Of course, the plot would be nothing without 5cm's soaring visuals. 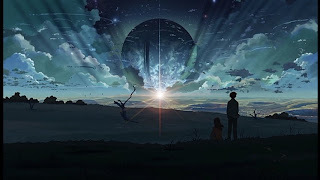 Shinkai loves the sky, so he never misses an opportunity to show someone staring up at the clouds, the stars, or the sunset (one of the most common motifs in the film). As such, 5cm maintains a consistent aesthetic throughout, as Shinkai shows repeated visions of snow, cherry blossoms, and incredible sunsets. If nothing else, Tono and Akari are brought together by these things of nature. They live side by side, running on parallel tracks through snow, rain, and wind. And no review of 5cm can be written without saying that everything, from trains to clouds to birds, is beautiful in this masterpiece. 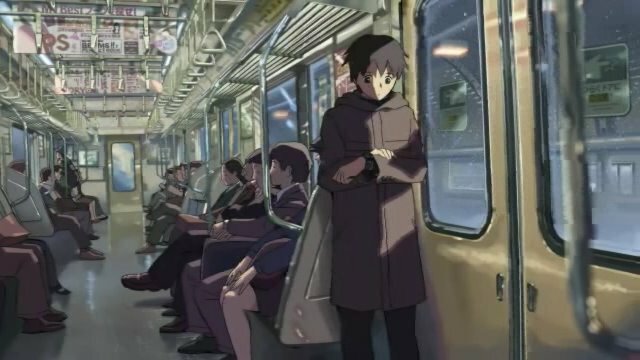 This is mostly thanks to Shinkai's deft weaving together of perfectly crafted modern scenes (trains and cars) and pastel-like nature scenes. Without a doubt this is the best-looking anime that I have ever seen. In the final five minutes of the third act, Tono thinks back on his experiences, and Shinkai chooses not to use a simple monologue (as he has for most of the film). Instead, he trots out an evocative, unexpected montage of scenes from parts one and two, all backed by a pop song that perfectly sums up the pained longing that Tono has felt throughout his life. The montage even weaves in scenes that the audience hasn't seen yet, filling in the gaps that viewers missed due to the three-act structure. Even though Shinkai's use of a quick-cut music video feels a little off in such a slow-paced movie, it manages to bring forth the themes of the film in a mere three minutes, and leaves the audience to watch the final minute of Tono's story with his entire life laid out before them. The final scene is a poignant yet simple moment that provides perhaps the best highlight of Shinkai's minimalistic attention to detail. Every whispered line of dialogue and every ray of light shining across a snow-covered train car is placed for its impact on the viewer. There is nothing extraneous in the tightly-wound plot of 5cm - everything in the film contributes to bringing the viewer closer to Tono's joys and pains. 5cm does indeed have a strange structure that might throw some people off. Additionally, the narration switches from Tono to Kanae to Tono in parts one, two, and three, and the montage scene at the end is a little jarring. While these changes might confuse some viewers, they lend uniqueness, and in the case of the POV switch, it gives the audience a momentary chance to see the introspective Tono as viewed from the outside. Makoto Shinkai has written a poem here in the pastel colors of the evening clouds. He has shown a man's life in the sunrise that crests a green-crowned hill. He has carved a work of art into the snow beneath a frozen cherry tree. 5 Centimeters Per Second is a resounding achievement of Japanese animation. A film of such uncompromising quality should not and cannot be left to collect dust in the annals of anime history.